There are three types of racing: match racing, as done in the America's Cup; handicap racing, where the elapsed times of different types of boats are corrected by formula to see who actually won, and one-design racing. One-design racing offers the most immediate gratification. If you are ahead of a boat, you are ahead, and if you are behind, you are behind. Simple. One small error or one beneficial tweak of the sail can change the outcome. In one-design racing, just as the name implies, a single boat type is used by all competitors. These designs are termed "classes"; some are quite large, others vary in number and character. All have in common a design standard and class organization to maintain an even footing. One-design sailing puts the premium on crew work, sailing skill, and racing savvy rather than spending money to go faster an thereby win. 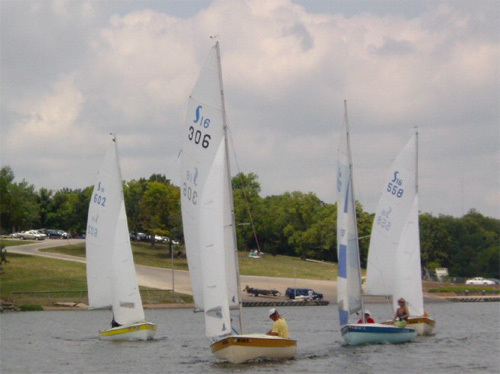 The Jacomo Sailing Club is a mainstay of one-design racing in this region. Except for private lakes, you will not find another one-design club within several hundred miles (Omaha and Lincoln, Wichita, and Tulsa are the closest). Not much else in boating matches the overall fun and challenge of one-design racing. The class pages detail the currently active fleets of boats. Call one or all of the contact people for more information. Come join us, and change your summers forever.